Comfort Grip. No more friction burns on your sweaty palms with this super-grippy foam grip. At creamchargers.org.uk we think that life should not contain more hardships than is completely necessary. The whole ethos of using nitrous oxide to make whipped cream rather than simply a whisk and a bowl is about ease and comfort – so it stands to reason that if we can make even the use of your nitrous chargers more comfortable then we should do. The comfort grip fits around the outside of the charger holder to make it easier to operate and much softer to grip – it will fit all of the chargers that we sell on creamchargers.org.uk. We especially recommend this product for use with any of the cheaper plastic models. Are you in the wholesale or professional trade? If you have a need to make larger quantities of whipped cream, or small quantities more frequently the comfort grip is certainly something that is worth you considering. It is just one of those simple things that can make your life easier. If you have a café and employ staff they will certainly thank you for taking the time to spend just that little bit of extra money on making their lives a bit easier. For the few pennies that you spend on this you may be rewarded with fewer staff absences and a harder-working more efficient workforce! 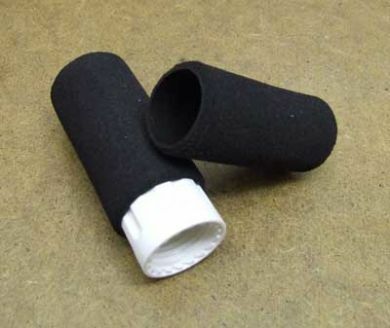 No more friction burns on your sweaty palms with this super-grippy foam grip. At creamchargers.org.uk we think that life should not contain more hardships than is completely necessary. The whole ethos of using nitrous oxide to make whipped cream rather than simply a whisk and a bowl is about ease and comfort – so it stands to reason that if we can make even the use of your nitrous chargers more comfortable then we should do. The comfort grip fits around the outside of the charger holder to make it easier to operate and much softer to grip – it will fit all of the chargers that we sell on creamchargers.org.uk. We especially recommend this product for use with any of the cheaper plastic models. Are you in the wholesale or professional trade? If you have a need to make larger quantities of whipped cream, or small quantities more frequently the comfort grip is certainly something that is worth you considering. It is just one of those simple things that can make your life easier. If you have a café and employ staff they will certainly thank you for taking the time to spend just that little bit of extra money on making their lives a bit easier. For the few pennies that you spend on this you may be rewarded with fewer staff absences and a harder-working more efficient workforce! The comfort grip is very light so when ordered with any other products there will be no increase in the delivery charge. The comfort grip really is as soft and silky as the whipped cream that is helps to create! This is made from recyclable plastic so please recycle after you have creamed in comfort.